The new Fairway Market is progressing well, and from the outside looks pretty much finished, however the actual date of opening is still not known. The new grocery store will fill a void that has existed at this shopping centre for quite sometime, ever since Overwaitea (?) closed it's doors many years ago. They used to occupy the space now used by the new London Drugs which was also the result of considerable renovating of the original mall. 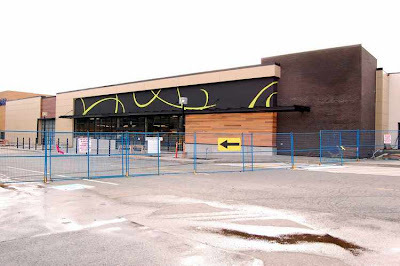 Nanaimo has been without a Fairway Market for many months now when the company closed it's Brooks Landing location in favour of their new store.